When I bought my Backcountry.com 700 ml Ti cook pot I did not realize that the small diameter of the pot would require a tiny stove to go with it. At least a tiny stove if I planned on using my side burner alcohol stoves, which I did. When I realized that the White Box SOLO stove was even too big for the cook pot, I was kind of stuck. 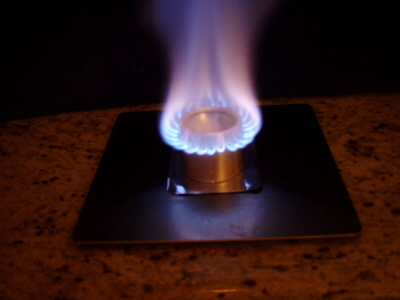 Of course I had other options, such as my Optimus Crux canister stove or just a simple open burner alcohol stove, but I have been into the side burners so I looked around. 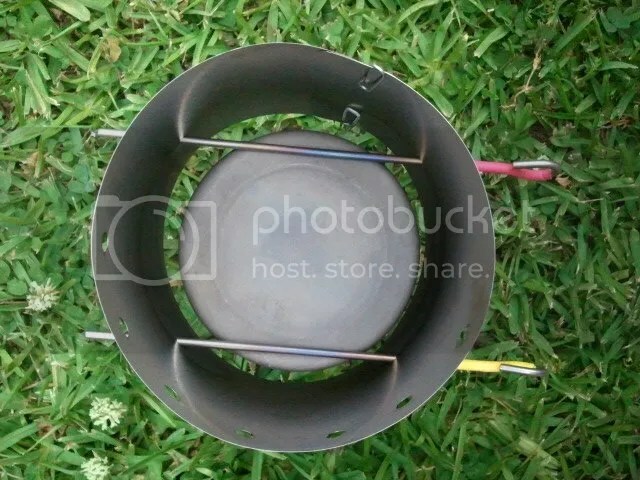 Then I came across the Gram Weenie Pro alcohol stove. The stove was basically a tiny White Box stove. Obviously, it is a side burner just like the WBS, except it has a much smaller diameter of only 1.75 inches. The small diameter of this stove would work well with the 3 5/8 inch diameter of my Ti cook pot, and it was very light-weight to boot! So, I ordered one of the GWP stove kits which included the stove, a windscreen & heat reflector / primer pan, a 4 ounce fuel bottle, and the 10 cm Imusa mug. As far as weight is concerned this is a pretty light set up. The stove weighs 0.7 ounces and measures 1 3/4 inches tall as well as 1 3/4 inches in diameter. The windscreen weighs 1 ounce and measures 23 1/2 inches x 3 1/2 inches. The heat reflector adds no weight that shows up on the scale and is a 2 1/2 inch square. The fuel bottle measures 0.7 inches, holds 4 fluid ounces and is a tinted green color. The Imusa mug weighs in at 2.5 ounces and measures 10 cm ( 3 7/8 inch) in diameter and 3 3/8 inches tall. The entire set up (stove, windscreen, heat reflector, and Imusa mug) weighs in at 4.8 ounces. If I replace the Imusa mug with my Ti cook pot the weight goes up to 5.3 ounces. 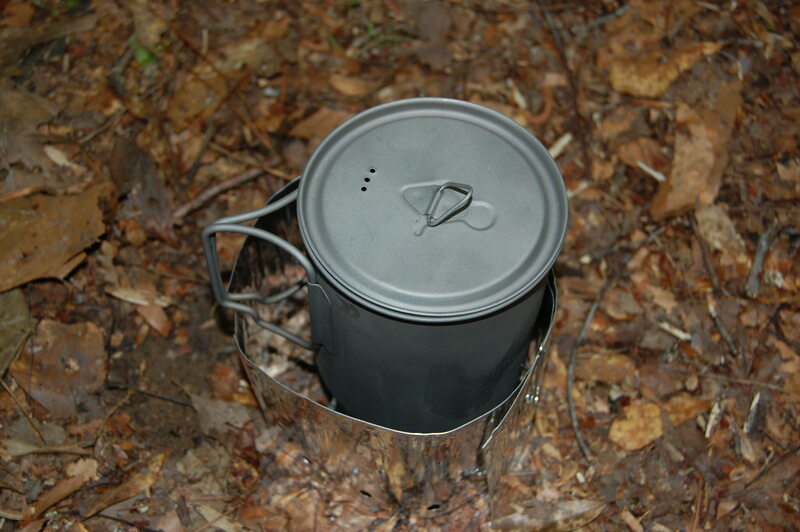 The mug can be used as a cook pot with the GWP stove, or simply as a light-weight mug. If the mug is used as a cook pot, a lid will need to be either acquired or made. A simple piece of aluminum foil should serve this purpose well, while maintaining a low weight. Last night I used the stove & mug set-up and it worked well. I did not use a cover over the mug, and 1 ounce of HEET brought 2 cups of cold tap water to a boil in around 9 1/2 minutes and then burned out around 11 1/2 minutes. 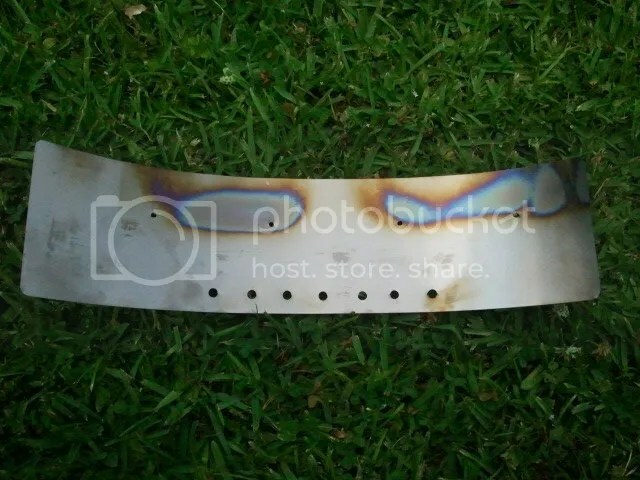 I also did a test burn with my Ti cook pot. I again used 1 ounce of HEET in the stove and 2 cups of cold tap water. I did use the lid on the cook pot. The stove brought the water to a full rolling boil around 8 minutes and 20 seconds, and completely burned out at 12 minutes and 30 seconds. At this rate I could probably get away with boiling two cups of water with a lesser amount of fuel in good conditions, however, I think it will be safer to still figure 1 ounce of fuel per 2 cups of water. The stove is well-built. End2End does not sand anything off of the stove when it is in production, so the stove is left with thicker walls, which means a stronger stove. Also, the stove features a rolled lip to hold the two pieces together rather than rivets or a glue. This makes the stove a very sturdy stove that can stand up to a lot of pressure. While the cook pot should not ever come close to crushing the stove, this is a good thing in case the stove is ever stepped on! Even though I just got this stove in the day before yesterday, it seems to be really well constructed, which means tough for such a tiny little stove. And with the nearly 8 1/2 minute boil time and 12 1/2 minute burn out time, it seems to be rather efficient. Of course I will use this stove with both the Ti cook pot as well as the Imusa mug. However, I will primarily be using the mug as my mug when I carry my kettle since I will be using my Ti cook pot as both the pot and mug on solo trips. I am impressed with both the stove and the mug. Upon initial impression, they seem to be of good quality and will be around for a while. From this impression I feel comfortable in recommending them to at least be looked into if looking for anything in this category. I will follow-up with a more formal report once I have used them in the field a few times. For now here is a video I did regarding the Gram Weenie Pro stove and the Imusa mug. Update: I did mention above (or maybe in the video) that the Imusa mug got hot when using to cook on, and that it took a while to cool down when using to cook in.I did not realize how easily it can become very hot though. This morning I decided to make a cup of coffee using the Imusa mug. I put the coffee in the cup, and brought some water to boil using my White Box Stove and GSI tea kettle. I poured the water in the mug, stirred the coffee up, and then reached for it. The mug (handle included) was HOT. So I let it sit for 2-3 minutes, still hot. I grabbed a paper towel to wrap around the handle and I was fine by doing this. However, once I attempted to sip from it, I realized quick like that the mug needed to cool way down before I could sip from it. I will say that the temperatures outside are in the 80’s so I imagine things would be different if the temperatures were around 30. It would probably cool down a little faster in those conditions. So, I will have to rethink using the mug for drinking hot beverages from, or find a way to overcome this. I guess I could simply let it sit for a little longer and let it cool that way. Update: Today I was able to take the Gram Pro Weenie with my Backcountry.com 700 ml Ti pot for a nice day hike. I bought this stove to use with this pot for solo trips, and today I took it with me on my day hike to Tishomingo State Park. 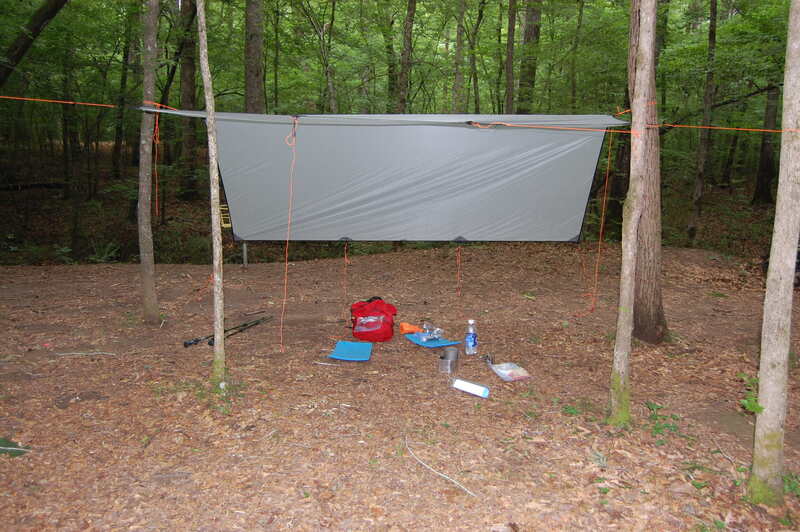 I stopped and made breakfast this morning under my OES 8 x 10 sil tarp. I simply boiled about 2 cups of water so that I could make me a cup of coffee and have some hot water to make my oatmeal. The stove preformed great, It brought the water to a boil quick enough. I got the water going, then got up to take a few pics, and when I came back it was boiling. I removed the pot from the stove and let the stove burn out. The outside temperature was in the mid 70’s, and there was very little wind to hinder the stoves performance. Before I left I used a hole punch and punched holes around the bottom of the windscreen to help ventilation. Also, the heat screen is a little small. Granted it is an appropriate size for this stove, I wouldn’t mind something slightly larger so I may look into a different heat reflector, even if it is just a larger square of tin foil. So, just wanted to report back on the stove. It did it’s job well, and I was happy to have it. Now I am looking forward to another trip in which I will be able to bring it along. I use the Caldera Keg system, which comes with a rubber ring bracelet to put around the mouth of the pot so you can drink from it/grab it. The ring is similar to those “cause” bracelets started by Livestrong. Maybe that can fix the problem for you! I’ve used many stoves over the years, but now I’m using alcohol stoves for the weight savings. I’ve made and tried many designs, including the Max Cat and Fancee Feast, but have settled on Zelph’s Starlyte design for the simple reason that the filling in the stove will hold the alcohol if you tip the stove over. 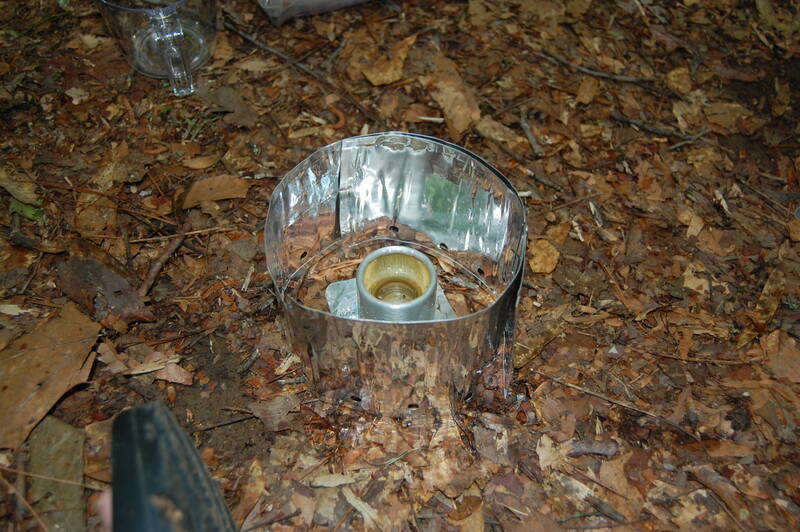 The reason that alcohol stoves are illegal in some areas is the danger of spilled fuel. I also have adopted Jim Wood’s Fire Bucket windscreen design. 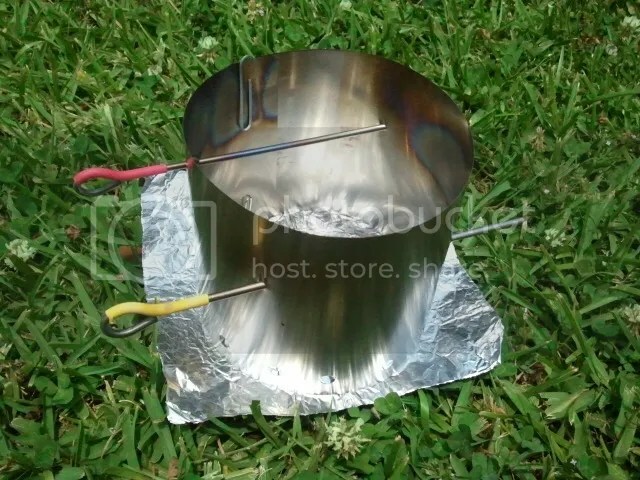 I make mine to suit the pot that I will be using out of 6″ aluminum flashing and use 1/16″ stainless steel welding rods for pot supports (similar to the way that you have used the stakes). With this setup, I don’t need the pot support that comes with the Starlyte, so I don’t put them on the stoves that I build. I am currently using an Olicamp heat exchanger pot with my stove and it will boil a pint of water one minute faster than a non heat exchanger pot of the same size. Since we typically burn all of the alcohol that we put in our stoves, I don’t know whether the heat exchanger is worth the trouble, but it’s a nice pot anyway. I also have the Starlyte, and like you, find it to be a very worthy alcohol stove. I actually have some videos of it on my youTube page. I typically use it with one opf my Evernew pots, which all have matching Sidewinder cones from Trail Designs. 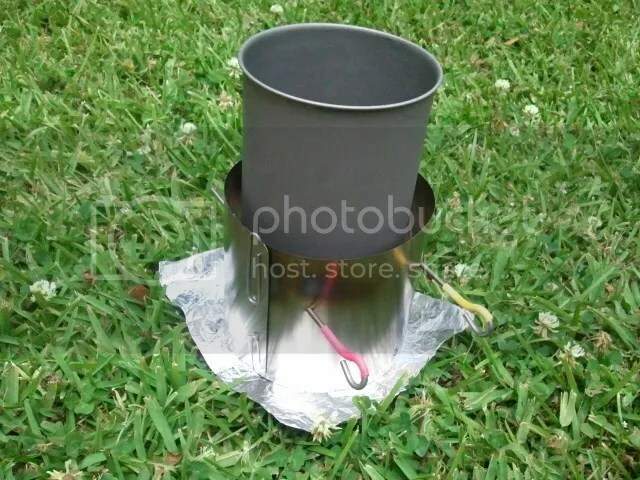 This is a great match as I don’t even need pot supports, the pot fits right in the cone (because of the lower profile of the Starlyte stove, I don’t need to use the stakes like the 12-10 alcohol stove uses). It is indeed an addiction, but a harmless and fun one. I thought I would always use canisters, but I have been doing a ton of research the last few days about alchy stoves and I am definitley not making progress on whats the best. Stick, can you tell me what would work well with my 4.6 x 3.9in tall Evernew pasta pot? (3.35oz). You seem like you know your stuff! I was thinking about an easy diy fancy feast, but from what ive read it might be too wide, and inneficient. So far I have the 700ml ti pot, and I bought some Ti foil from Ti Goat to make a windscreen once I figure it out. And last but not least, would you be interested in selling me a stove? Harmless…depending on how you look at it… 🙂 Definitely fun though! I will admit, I absolutely love my alky stoves and they are my preferred stove when heading out on any of my trips. They are just more fun to me, and I am not typically in a rush to cook my food. I do not despise canister stoves, they’re just not as much fun for me! For me, I have decided that I prefer either open or small top burner alcohol stoves for smaller diameter cook pots. Some smaller side burners will work, but I tend to like side burners for wider cook pots. The downside about this is that the open or small top burner stoves will (more than likely) require a pot stand of some sort, which is more weight. However, my suggestion for a stove for a cook pot that diameter, I would suggest the Mini Bull Designs Mini Atomic stove. These are about $20, plus shipping. It is a top burner and burns pretty hot, but it has a small flame patterns, which is good because it keeps the flame under the stove. Making a windscreen is pretty simple, and you can even use some small ti tent stakes to skewer through the windscreen to form a pot holder. I would measure the windscreen to be no taller than the inside of your cook pot so that it will fit inside the pot. Then, measure enough out to be able to wrap it around your pot with about a 2″ overlap. I would also allow between 0.5″ – 0.75″ between the sidewalls of the cookpot and the windscreen. There are a few different ways that you can connect the ends, but I just use 2 paperclips (one on the top and one on the bottom). Then once you get the windscreen made, you can punch holes around the bottom as well as drill 4 holes along the middle of the windscreen so that your stakes can fit through it. I would suggest using a drill bit that is just a hair bigger than the stakes you will use so that the stakes will sit more stable in the windscreen. Here are some pics from one that I made. I actually found your blog via your YouTube channel. You have some really interesting and informative videos; thanks for all your efforts. 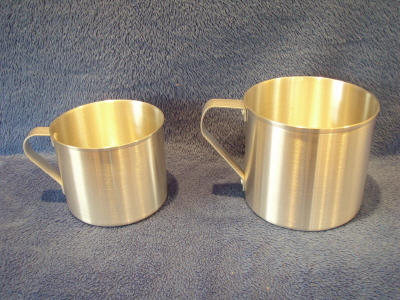 As an FYI, End2End Trail Supply is running a special on their Evernew Titanium pots. If you order one of their Ti pots, you get a few stove of your choice. I just ordered the .64 liter deep series ti pot for $35 and got the Gram Weenie Pro for free. I just placed the order so I haven’t received my gear yet, but I consider that an awesome deal, and I had to pass it on. Thanks again for all your efforts. I would not have known about End2End trail supply or the Gram Weenie Pro if it were not for your YouTube channel and your blogs. Glad you found my blog, and super-glad that you are enjoying it! Thanks for stopping by and commenting. That sounds like a cool score on your E2E order. I like the overall quality of my GWP and it does what it says it does, no more. So no complaints in its functionality. I hope that you enjoy your new set-up.